What Else Can I Expect from an Online Behavioral Psychology Program? Behavioral psychology is a specialized branch of psychology that studies the motives behind the way we think, feel, act and interact with one another. Also known as behaviorism, this field is grounded in the theory that external stimuli and conditioning are at the root of human behavior. As a result, behavioral psychologists focus on the environmental factors that play a role in how we acquire, learn and hone different behaviors ― as well as conditioning techniques that can be used to address and correct harmful behavior. 'Psychology' and its subfields (such as behavioral psychology) are among the most popular majors for bachelor's degree-seekers. According to the National Center for Education Statistics, roughly 114,000 psychology bachelor's degrees were awarded during the 2012-13 academic year. However, most careers in psychology require an advanced education; job candidates typically enter the workforce with a master's or doctoral degree. Additionally, psychologists in public practice must be licensed in all 50 states and the District of Columbia. A bachelor's in behavioral psychology will provide foundational knowledge for students who are planning to pursue a graduate degree, obtain licensure and compete for jobs in their field. In addition to standard coursework, these bachelor's programs usually include internships and/or clinical residencies; these onsite courses allow students to receive supervised, hands-on training from experienced professionals. A comprehensive capstone project may also be required. Many of today's students are choosing to earn their bachelor's degree in behavioral psychology online, rather than in a classroom. Online students follow the same rigorous curricula as their brick-and-mortar counterparts, leading to the same number of post-degree employment opportunities. The asynchronous (or self-paced) format of most online programs is also ideal for students with part-time jobs, childcare duties and other commitments that may interfere with campus-based learning. Learn more about what you can do with an online bachelor's degree in behavioral psychology and what kind of career opportunities you can look forward to with this comprehensive guide. WILL AN ONLINE BEHAVIORAL PSYCHOLOGY DEGREE PROGRAM PROVIDE ME WITH THE SKILLS I NEED TO ADVANCE MY CAREER? A bachelor's degree is a critical first step for students who wish to pursue a career in behavioral psychology. Typically, the curriculum for an online bachelor's in behavioral psychology degree will introduce fundamental areas of psychology, such as cognitive, developmental, social and organizational psychology. Upper-level undergraduates will also review case studies and learn about the effective research methods. The best online bachelor's in behavioral psychology degree programs will prepare students to advance into any master's programs. WILL AN ONLINE BEHAVIORAL PSYCHOLOGY DEGREE PROGRAM WORK WITH MY SCHEDULE? Online psychology degree programs offer a flexible alternative to traditional brick-and- mortar education. Students are usually able to access course readings and lectures, submit written assignments, take exams and communicate with their professors on their own schedule. The latest in e-learning technology also enables them to study away from home using a laptop, tablet, smartphone and other Wi-Fi-compatible devices. For added convenience, online psychology students can normally coordinate internships and practicum courses at sites near their current residence. WHAT JOBS CAN I GET WITH MY BACHELOR'S IN BEHAVIORAL PSYCHOLOGY? The bachelor's in behavioral psychology degree will not be sufficient for pursuing a career as a practicing behavioral psychologist; these job titles require an advanced degree and licensure. However, a bachelor's program will prepare most students for the challenges and demands of a graduate-level program and post-degree work. Bachelor's degree-holders may also qualify for entry-level jobs, such as research assistance and supportive clinical staff. Alternatively, bachelor's in behavioral psychology recipients may be eligible for careers in other fields, such as business, education, social work and criminal justice. 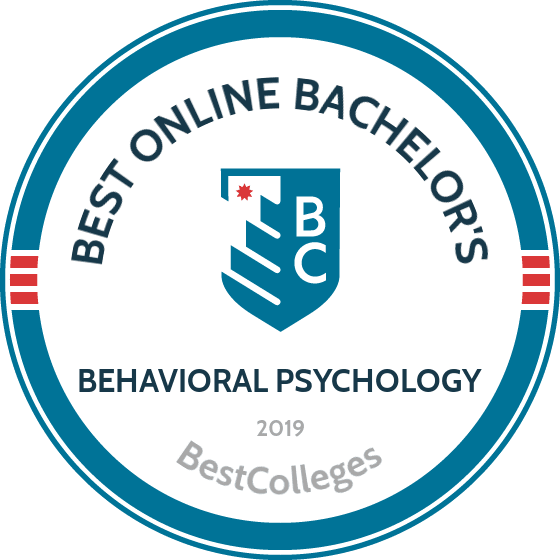 WHAT ARE THE BEST ONLINE BACHELOR'S IN BEHAVIORAL PSYCHOLOGY PROGRAMS? Choosing a program is an incredibly personal decision, and only you can properly evaluate whether a target school's strengths match your educational needs. The following ranked list of schools should serve as a helpful starting point in your search for the best online bachelor's degree in behavioral psychology programs in the United States. Our ranking is based on the courses schools offer, available specializations, student outcomes, career support services, and other criteria used to determine academic excellence. If you are considering an online bachelor's in behavioral psychology, be sure to contact admissions specialists at different colleges and universities to learn more their about specific bachelor's degree requirements and offerings. Central Methodist University, a private college with a Wesleyan heritage, opened in 1854. The College of Graduate and Extended Studies, with more than 4,000 students, offers classes in Fayette, Missouri, at the main campus or completely online. One of those online programs includes the bachelor of science in applied behavior analysis degree. The 120-credit program prepares students to work with children who have learning and development issues. CMU's curriculum also preps students to take the national accrediting exam. Throughout the program, students learn about stimulus control and how reinforcement and punishment can effectively modify behavior problems. Courses also cover B. F. Skinner's six elementary verbal operants and how to apply them in the field. All students complete an introduction to psychology course as part of the ABA program. Once students complete their general education requirements, they take courses such as child development, autism spectrum disorder, and applied behavior analysis for educators. The program also requires students to complete a hands-on practicum to apply the knowledge and skills learned in class while working under supervision in the field. To apply to CMU, transfer students must submit their high school and college transcripts, showing at least a 2.0 GPA. Incoming freshmen students must complete a college preparatory program with a minimum of 2.5 GPA, which must include four years of English, three years of math, three years of science, three years of social studies, and a year of a second language. Bellevue University, a private college founded in 1966 in Nebraska, offers more than 75 bachelor's and graduate online programs. For students who want to make a difference in the human services field, the university offers an accelerated online bachelor of science in behavioral science program. The 127-credit program combines psychology, sociology, and counseling, with curriculum emphasizing projects and activities that give students practical experience in counseling and treatment strategies. Coursework also introduces students to social and human service agencies which help people. Classes from the Kirkpatrick Signature Service and courses such as professional success in behavioral science and introduction to human services emphasize active citizenship for its students. Kirkpatrick classes include freedom and responsibility, tradition and change, and American vision and values. Online classrooms feature less than 24 students who work in a cohort. Students can access library services, technical help, and online tutoring and writing assistance. Graduates of this online behavioral psychology degree often pursue jobs as social workers, counselors, mental health and substance abuse social workers, and rehabilitation counselors. Students also go on to earn a master of arts in human services or master of science in clinical counseling. Applicants must hold an associate degree or have completed 60 college credits with a "C-" grade or better. Students who do not meet the requirements may take courses through Bellevue University. All candidates must submit an online application and college transcripts or proof of completing high school. Saint Francis University, a Catholic coeducational private university, sits on 600 acres in Loretto, Pennsylvania. Saint Francis University dates back to 184 and features more than 50 undergraduate, graduate, and adult degree programs. The bachelor of science in behavioral science program, offered through the Adult Degree and Continuing Studies program, appeals to working professionals. Asynchronous coursework with set due dates but no in-class requirements benefit students with busy schedules. Students can take this 128-credit program completely online and never step foot on campus or complete a hybrid program with some in-class experiences. Graduates take what they learn in this online behavioral psychology degree and go on to earn a master's degree in behavioral psychology online. Others become counselors and social workers, or even work in law enforcement. This interdisciplinary degree combines psychology, sociology, and social work. Students learn about at-risk populations and how to administer services to diverse communities. At the end of the program students display a strong understanding of current technologies and research methods used in the field. Saint Francis University offers a free credit audit for transfer students, accepting up to 98 credits from previously completed college coursework. The college also offers credit for military training, vocational school, and CLEP exams on a case-by-case basis. Applicants can submit their hard copy or online application throughout the year since the school has rolling admission. The college offers two start dates every semester. To apply, students must also submit a letter of recommendation, resume, and official transcripts. Wilmington University, a commuter school, offers classes onsite at its main campus in New Castle, Delaware, and branch campuses located throughout Delaware and New Jersey. Around 44% of students take classes online at Wilmington University. The bachelor of science in behavioral science requires students to complete 40 courses and a total of 120 credits at Wilmington. As an online behavioral psychology degree that combines cultural anthropology, psychology, and sociology, students learn how cultural and social issues impact people and communities. In their senior year, students typically take a supervised internship at a psychiatric facility, nursing home, or other social services agency. Students enrolled in online classes meet weekly assignment and reading deadlines. Online courses run on 15-week semesters or an eight-week block format. Classes start every eight weeks. Students interested in earning a master's degree in behavioral psychology online can opt for the accelerated bachelor's program, which prepares students to enter the master in science in applied family science. Wilmington University also offers hybrid courses with 50% of in-class experience and 50% online classwork. The university also offers accelerated fusion courses, a combination of online and in-person classes, in three five-week sessions each semester. Freshman applicants must submit high school transcripts and complete a math and English assessment if they did not complete the required credits. All candidates need to meet with an admission specialist after submitting an application and paying the application fee. Transfer students must submit transcripts because the university's generous transfer policy allows students to transfer up to 90 credits. Mercy College, a nonsectarian college founded in 1950 in Westchester, New York, aims to provide educational access to traditional and working professional students. Students can attend classes in the districts of Manhattan, Bronx, Yorktown Heights, Dobbs Ferry, and online. The college offers 90 undergraduate and graduate degree and certificate programs and 40 online programs, including the online bachelor of arts in behavioral science and bachelor of science in behavioral science. Both online behavioral psychology degrees require students to complete 120 credits, which break down into 60 general education credits, 36 credits in behavioral science, and 24 electives. The college offers a completely online program or a hybrid degree with some in-class sessions. Students can also access books, journals, and articles online through the library's network. This multidisciplinary program teaches students the major concepts of psychology and sociology so that at the end of the program, students can apply principles of psychology and sociology to individual and group situations. Graduates find work in health services, gerontology, counseling, and education. Full-time students can complete the program within four years. Mercy accepts up to 75 credits from an accredited two-year college and 90 credits from four-year accredited schools. The first step in applying includes meeting with an admissions counselor. Students should bring a hard copy of their application and transcripts for their meeting. The college does not require ACT or SAT scores. All U.S. states and the District of Columbia require public-practice behavioral psychologists to be licensed in the state where they work; in most states, candidates for licensure must first earn a doctoral degree, complete an internship and fulfill at least one to two years of supervised work experience. Psychology is a complicated field that lends itself to concentrated areas of study. If you want to consider your options beyond a general online psychology degree, click through the following list for information about schools that offer specializations within their psychology degree programs. The job outlook for graduates with a behavioral psychology degree is somewhat mixed. On one hand, bachelor's recipients overall enjoy a lower unemployment rate than their counterparts with an associate degree or lower. According to the Bureau of Labor Statistics (BLS), the median unemployment rate for a bachelor's degree-holder in the U.S. is 2.8% ― a full percentage point lower than the unemployment rate for those with an associate degree. However, the specialized nature of psychology and its subfields can lead to high unemployment rates for students who do not pursue a graduate degree in their field. The table below looks at the unemployment rates of college graduates between the age of 25 and 29, based on their undergraduate major. This data comes from a recent survey published by the NCES. As the table indicates, the unemployment rate for psychology degree-holders is significantly higher than most of the other majors. Additionally, the unemployment rate for all occupations is currently set at 4.8%. In addition to degree attainment level, salary expectations for employees with a bachelor's in behavioral psychology will largely depend on their specific job title. Other factors include licensure status and city/state of employment. Using data from PayScale, the next table examines career salary projections for five of the most common professions in behavioral psychology. All of these career paths are generally attainable with a bachelor's degree or less. All five careers listed on the table reported a salary growth rate of at least 15% after 20 years in the workforce. Behavior specialists experience the highest rate of growth: a 47% increase in earnings between the entry-level and late-career stages. Behavior analysts and ABA therapists ranked second in terms of salary growth; both career paths reported a career increase of roughly 40% after two decades on the job. Students who earn an online bachelor's in behavioral psychology and plan to become licensed psychologists will be well-prepared for the demands of successive master's and Ph.D. programs. However, many bachelor's in psychology recipients choose to enter the workforce and launch their career without obtaining higher credentials. Four of the most common career pathways for individuals with a bachelor's in psychology are detailed below. Human Resources Specialists: HR specialists are primarily responsible for recruiting, interviewing, screening and hiring new employees for their company or organization. In larger workplaces, they may also mediate conflicts, create training programs and assist employees with matters related to their compensation, benefits and professional advancement. Social Workers: Social workers offer assistance and support to clients in areas like education, employment, independent living and mental health counseling. Social workers often work with niche segments of the population, such as children, families and the elderly. Clinical and non-clinical social workers must be licensed to work in most U.S. states. Market Research Analysts: Using principles of behavior psychology and sociology, market research analysts develop ways to market and promote products to different consumer demographics. Their work involves thorough analysis of both customer and market trends. Training and Development Managers: Training and development managers create educational programs for different employee groups in a given company or organization. They also study organizational needs and personnel skill-sets in order to develop programs that are relevant and beneficial for both employees and the company as a whole. Students who graduate with a bachelor's degree in psychology often go on to pursue a master's degree in the same field. For more information about opportunities for grad students and more advanced careers in this field, please visit our Guide to Online Master's in Psychology Programs. Making professional connections and learning about different approaches to behavioral psychology is crucial to your success. Professional organizations offer a great entry point for students who want to learn more about their chosen career path. Below you'll find three of the country's most prominent organizations established for behavioral psychology professionals. These organizations host networking events, provide online trainings, maintain active job boards, and offer other services for career-ready college graduates. American Psychological Association: The nation's leading organization for professional psychologists, the APA today boasts more than 117,000 members. The website features a vast online library, a job board, continuing education opportunities, and a Psychology Help Center with links to blogs and articles about various psych-related topics. The APA also serves as the official accreditation agency for collegiate psychology programs. American Board of Professional Psychology: Established in 1947, the ABPP oversees the standards and criteria used to certify and license practicing psychologists. The board awards certification to qualifying applicants in 15 different niche areas, including clinical psychology, couple and family psychology, and school psychology. National Alliance of Professional Psychology Providers: NAPPP is dedicated to promoting professional psychology through academic research and public advocacy. Members receive discounted electronic health records and reduced malpractice insurance, along with free continuing education courses, training tools, and job leads.